History of Duncans Mills | Duncans Mills, CA 95430. Camping, Restaurants, Bars, Shops, Antiques, Art, Wine, Recreation. In the spring of 1876, Sam and Alexander Duncan had lost their logging camp to high water for the 14th time since moving down to the Russian River from Salt Point. The inner lip of the mouth of Slavianka – (the Russians’ endearing name for the beautiful stream) – protected from stormy ravages of the sea by headlands, had seemed an ideal location for a sawmill’s village. Hauling the redwood timber over the mountain hump by rail to the coastwise steamships that were anchored by cables in Duncan’s dog hole just to the south, was most convenient. But losing the stockpiles of logs, the finished lumber and the workers’ bunkhouses every spring was plain foolhardy. Besides, the vast uncut redwood forests on the north bank were rich in temptation. San Francisco’s need for lumber grew even more prodigious; half of the world seemed drawn to the magic horseshoe shape of its bay front, and a sheltering New England style home was a first priority up and down the Pacific Coast. In 1877 the young Scotsmen, Sam and Alex Duncan barged their sawmill five miles upstream to a fine, sunlit flat in a curve of the Russian River. They floated their United States Post Office, built in 1862, upriver, as a mark of stability. A permanent address made a riverbank a Place, a legal part of the United States. Duncans Mills! Astute politics brought the railroad from Sausalito right to the mill site and each day a flatbed loaded with strong young adventurers appeared, looking for work, or with dreams of independent enterprise. John Orr bought a section of the Muniz Rancho land grant, put up the best saloon north of the Bay, and jealously guarded his monopoly of the spirits’ business. He sold a piece of land to Christopher de Quien, a young man from Louisiana, via Marysville/Sacramento, where he had been a Pony Express rider. Of French royalty, the lad had style, and built a hotel to accommodate the drummers, tourists, investors, artists and recreationists that came in daily on the rails. 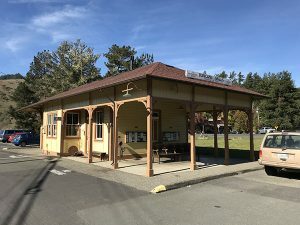 De Quien built a livery stable with rental horses and stage coach service up the coast to Gualala, Fort Bragg and inland. Remnants of the stage coach road still appear along the hillsides west of Duncans Mills. On a sultry afternoon, listen for the ghosts of buggy drivers, squeaky wheels, and horses snorting within the dust devils that hide them. Americans could not cope with the name ‘de Quien and corrupted Christopher’s name to “Queen.” With that moniker he eventually moved south to San Francisco, where greater fortune beckoned. Sam Duncan drifted on, too. Alex remained to build a prestigious lumber empire. Three grand hotels accommodated important Easterners and their entourage, the soon-to-be-President of the United States, General Ulysses S. Grant, among them. Mark Twain’s travel books noted the Western rail and stage routes. Thaddeus Welch, Julian Rix, Henry Raschen, among other notable 19th Century artists, painted this curl of the River canyon, lying like a bright smile on the north coast. When the United States Patent Office was established, Alex Duncan traveled to Washington, D.C. to take out one of the first patents on the log-jack device he invented. His simple but explicit drawing of the tool appears in the archives in the same volume of records as Levi Strauss’ outline sketch of the bibbed denim overall. The North Pacific Coast railroad came to Duncans Mills in the 1870’s until the last train left in 1935. 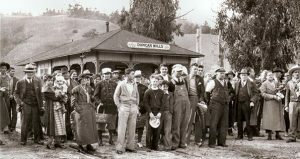 People came from San Francisco on the ferry, received their tickets in Sausalito and headed north to the end of the line – Duncans Mills! A narrow gauge spur continued to Cazadero. Tourists enjoyed swimming, boating, and fishing in John Orr’s pond. The 1906 earthquake devastated Duncans Mills. Three grand Victorian hotels collapsed, citizens fled and recovery was slow. The young moved on to other scenes, the town sank back into the swamp with no human energy to control the forces of nature. John Orr’s lovely lily pond choked down. The undredged creek flooded the sagging town annually, pulling the buildings into the bog. Swift-growing willows buried the railroad station and sites of the grand hotels and homes. Christopher Queen’s Hotel, DeCarli’s General Store, and John Orr’s saloon still remain. The restored railroad station stands proud, having won the California Historical Society Award for the best restoration of 1971. It is surrounded by support buildings in keeping with its historicity, carefully reproduced by the Wallen and Ferreira families. The Casini family again provides fine recreation areas on the south banks of the lovely Slavianka. An old-world ambience pervades the hamlet, gleaming railroad cars waiting on the track. Population 20 (now 85), elevation 36, Duncans Mills is an awakening Sleeping Beauty.